I’ve never been a fussy person. I like to keep things as simple as possible. I’m a big believer in “less is more.” That’s true here on BoB as well. I love sharing simple yet amazing recipes with you! But sometimes there are recipes that are even simpler than the norm yet are so very, very good that I can hardly wait to tell you all about them. 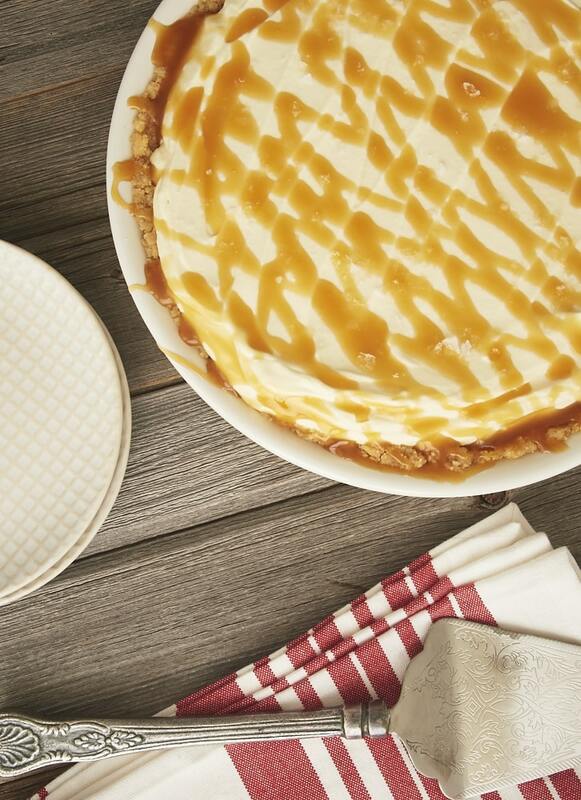 This Salted Caramel Whipped Cream Pie is the newest member of that elite club. What’s so simple yet amazing about this pie? It’s consists only of a no-bake cookie crust, brown sugar-sweetened whipped cream, caramel, and a bit of salt. No, really. That’s it. You’ll have this put together and chilling in no time. The only thing quicker is how fast it will disappear! The only liberty I took with the recipe was with the crust. You can use your favorite crunchy cookies to make the crust, but I opted for vanilla wafers to complement all that caramel. But it would be equally as amazing with graham crackers, Biscoff, chocolate wafers, or just about anything else you might have in your pantry. 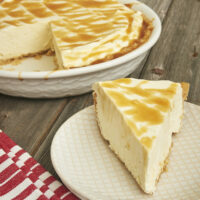 As for the caramel, I used store-bought just to keep things as simple as possible. If you have a homemade version you prefer, then you’ll just add a few more minutes of prep to this dessert. I do recommend a nice, thick caramel sauce so that it will hold up well with all that whipped cream. This pie is destined to become a go-to quick and easy dessert. It’s simple. It’s quick. It’s cool and creamy. It’s sweet and salty. It’s pretty much dessert perfection. Visit the Recipe Index for more no-bake recipes! Salted Caramel Whipped Cream Pie is brilliantly simple and delicious! Stir together the cookie crumbs and butter until thoroughly combined. Stir together the gelatin and cold water, and allow to stand for 1 minute. Heat 1/2 cup cream in the microwave for 45 seconds. Pour over the gelatin and whisk until the gelatin has dissolved. Refrigerate for 5 minutes. Place the remaining 2 & 1/2 cups cream, brown sugar, and vanilla in a large, cold mixing bowl. Using an electric mixer with a whisk attachment, beat at medium-high speed until the cream begins to thicken. Gradually add the gelatin mixture and continue beating until medium peaks form. Transfer the whipped cream to the prepared crust, and spread evenly. Refrigerate at least 6 hours. Drizzle with caramel and sprinkle with a salt before serving. *Substitute your favorite crunchy cookie for the crust – graham crackers, chocolate wafers, etc. **As a general rule, I prefer to bake cookie crusts at 350°F for about 10 minutes just to make them a bit sturdier. But freezing the crust is a great alternative to make this a truly no-bake dessert. Recipe slightly adapted from Taste of the South.